Friday February 12th 1926 Went down town early. Mattie Stitt met me at Bullocks. We went to lunch and picture show. I had to take my umbrella to be mended. It was a showery day. Went to the office. Maime came for us. Miss Eavens came out. Saturday February 13th 1926 It rained by spelled most of the day. I went over the house and wrote to Sister Ida, Mattie Fletcher, Ida Burkett and Belle Murry. It rained so I did not try to go to the city. Maime late home & Ott came out alone. Letter from Mrs Patterson. Sunday February 14th 1926 Still showery. I wrote Aunt Emma. Miss Eavens and a friend here for dinner. The Browns from San Pedro called. After that we drove to Hermosa Beach. Supper after we came home. Miss Eavens stayed all night. 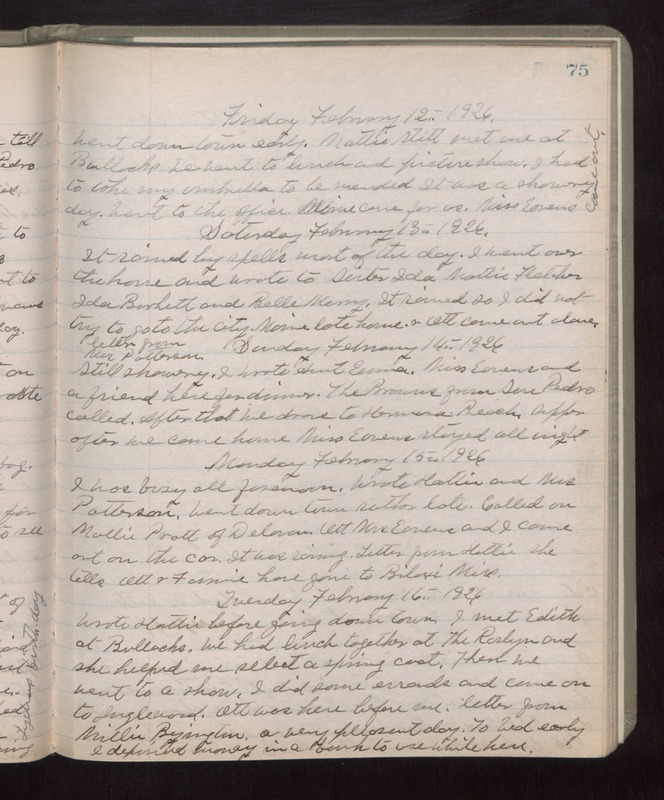 Monday February 15th 1926 I was busy all forenoon. Wrote Hattie and Mrs Patterson. Went down town rather late. Called on Mollie Pratt of Delavan. Ott, Mrs Eavens and I came out on the car. It was raining. Letter from Hattie. She tells Ott & Fannie have gone to Biloxi Miss. Tuesday February 16th 1926 Wrote Hattie before going down town. I met Edith at Bullocks. We had lunch together at The Roslyn and she helped me select a spring coat. Then we went to a show. I did some errands and came on to Inglewood. Ott was here before me. Letter from Millie Byington. A very pleasant day. To bed early. I deposited money in a bank to use while here.